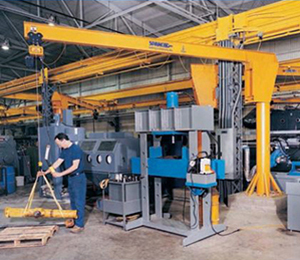 With two foundationless Jib Crane choices (base plate mount and sleeve insert), you have the options you need to add this handy machinery to your warehouse. But what do you need to consider before installation? Can my floor handle the load? Concrete is very brittle and has virtually no strength when loaded in tension, so great care must be taken to keep workers safe before bolting any crane to a concrete floor. Concrete, when overloaded, can crack and catastrophically break, which can result in dropped loads or, worse, the crane falling over. Before a foundationless jib crane is chosen, calculations must be performed to ensure that the existing concrete floor can safely handle the crane’s rated capacity. These calculations ensure that your workers are safe from catastrophic concrete failures. Is a second opinion needed? Does the crane manufacturer’s sales literature state that the “customer is responsible for determining concrete strength”? If that’s the case, you will need to hire a local structural engineer to perform all the calculations required to determine if your existing concrete fulfills all the safety requirements of the International Building Code (IBC). Minimum requirements – Has the crane manufacturer specified the minimum steel reinforcement thickness, diameter, and spacing required to keep your workers safe? Concrete requires a minimum amount of steel to strengthen the concrete and keep it safe from catastrophic breaking during use. Not supplying enough steel reinforcement or using a thin, wire mesh can lead to a sudden and complete failure of the concrete. If the steel sizes are not specified, it is most likely because you are responsible for performing the proper calculations to determine the safe amount of steel required to keep your workers safe. Reinforcement locations – Has the crane manufacturer specified the proper steel reinforcement location and elevation required to strengthen the concrete properly and keep your workers safe? Amount of concrete space needed – Is there a listed the minimum length, width, and square footage of concrete required to keep your workers safe? 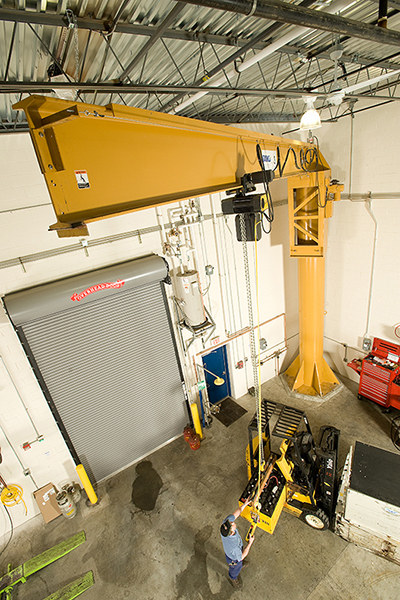 Cranes require a proper amount of concrete counterweight to stay safe and stable during use. Not supplying enough counterweight can lead to an unsafe and unstable condition. Distance from cracks and/or seams – Is the minimum distance the crane can be installed from a crack or concrete seam been identified by the manufacturer? The closer a crane is mounted to a seam or crack, the weaker the concrete. The minimum safe distance must be specified in all cases to keep workers safe. Bolt strength – Has the crane manufacturer specified the minimum bolt pull-out strength? This must be listed to ensure the safety of your installation. Finally, if in doubt, ask the foundationless jib crane manufacturer if they have the calculations performed to the International Building Code that proves the safety of the concrete floor they suggest.